Ecology is the study of the relationships of organisms with their living and nonliving environment. No organism exists entirely independently of other living and nonliving things around it. A cactus in the middle of the desert, for example, draws nourishment from the air and from the ground. It depends on sunlight for energy needed to grow. 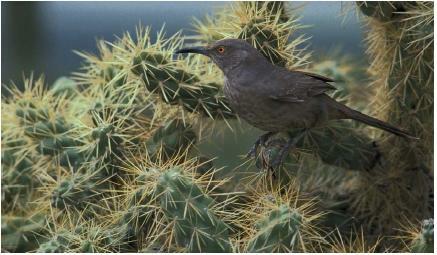 The cactus may be home to birds, lizards, and microscopic animals. Even relationships that seem to be stark and simple as that of the cactus with its surroundings involve complex ties that form the subject matter of ecology. Ecological relationships are always reciprocal (shared) relationships. In the example of the cactus, elements of the physical environment, such as air and water, have an impact on the cactus. But, at the same time, the cactus affects its physical surroundings. For example, it releases water vapor and oxygen into the air, changing the composition of the surrounding atmosphere. Living relationships are also reciprocal relationships. The cactus may provide food, shelter, and shade for animals that live in or near it. But animals also contribute to the life of the cactus, by distributing its seeds, for example. Although mostly a biological subject, ecology also draws upon other sciences, including chemistry, physics, geology, earth science, mathematics, computer science, and others. As the impact of humans on the environment increases, the subject matter of ecology expands. Ecologists may be asked to decide whether a desert should be left in its natural state or opened to certain forms of human development. As a result, ecologists increasingly find themselves confronted with social, economic, political, and other nonscientific issues. Because it draws upon knowledge and information from so many disciplines, ecology is a highly interdisciplinary field. Community: A collection of populations that interacts with each other in the same geographic region. Interdisciplinary: A field of investigation that draws upon knowledge from many disciplines. Photosynthesis: The sequence of chemical reactions by which green plants convert carbon dioxide and water into starch and oxygen, using energy provided from sunlight. That ecologists focus on biological subjects is apparent from the fact that most ecologists spend much of their time engaged in studies of organisms. Examples of common themes of ecological research include: (1) how organisms adapt to their environment, (2) how the numbers and distribution patterns of organisms in an area are influenced by environmental factors, and (3) changes in the number of organisms in a area over time and how the environment influenced these changes. One of the major areas of interest in ecology is the flow of energy through an ecosystem. (An ecosystem, or ecological system, is a collection of communities of organisms and the environment in which they live.) The source of almost all life on Earth is energy from the Sun, in the form of sunlight. That energy is captured by green plants in the process known as photosynthesis. When herbivorous (plant-eating) animals consume plants, they incorporate solar energy stored in those plants into their own bodies. Later, carnivorous (meat-eating) animals consume the herbivores, and solar energy is passed another step through the living world. Eventually, plants and animals die and are consumed by organisms known as decomposers (or detritivores; pronounced de-TRY-tuh-vorz). The complex of ecological relationships among all of the plants, animals, and decomposers is known as a food web. The ultimate goal of ecology is to understand the nature of environmental influences on individual organisms, their populations and communities, on landscapes and, ultimately, the biosphere (all life on Earth). If ecologists can achieve an understanding of these relationships, they will be able to contribute to the development of systems by which humans will be able to wisely use ecological resources, such as forests, agricultural soils, and hunted animals such as deer and fish. This goal is a very important one because humans are, after all, completely reliant on ecological goods and services as their only source of life support. what are the other examples of ecology? for examples the figure of a forest, is that a example of ecology? i want to ask, can you give me some of example of human ecology?